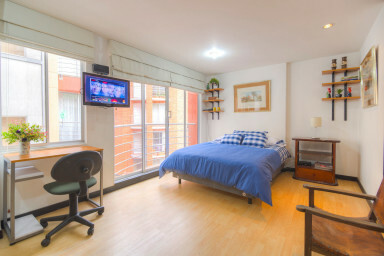 The apartastudio is located in Chapinero Alto (Calle 61 y Carrera 4), one of the most exclusive and exciting neighborhoods in Bogotá. It is a culturally diverse hot spot, full of nightlife, restaurants, and the best gastronomy area in the city, a definite favorite among visitors to Bogotá. Everything you need for a private, comfortable, convenient and affordable stay (Wi-Fi, fully equipped kitchen, TV). The apartastudio is located in Chapinero Alto (Calle 61 y Carrera 4), one of the most exclusive and exciting neighborhoods in Bogotá. It is a culturally diverse hotspot, full of nightlife, restaurants, and the best gastronomy area in the city, a definite favorite among visitors to Bogotá. Everything you need for a private, comfortable, convenient and affordable stay (Wi-Fi, fully equipped kitchen, TV). 5 minute walk to Zona G the best gourmet area of Bogotá. Mini-Supermarkets and tiendas within a few meters of the building, large Supermarkets under 10 minutes walk.